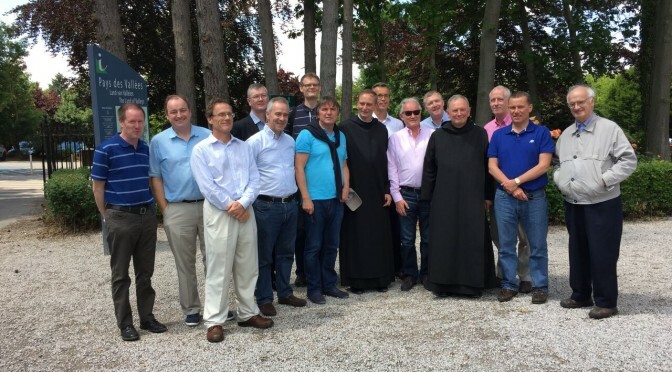 This is Frank Hall’s officially censored report of our class reunion four weeks ago in Namur, Belgium, close to Maredsous, the cradle of Glenstal. The idea to meet in Maredsous came about as 3 of us from the Class of 1980 had spent a term at the school as exchange students in the late 70’s. The three day event started on Friday evening, 26th June with an aperitif at the hotel “Chateau de Namur”. The Hotel de Namur is a small castle situated above the Citadel and visible from virtually anywhere in the surrounding area. 13 out of our year of 16 attended, most of whom brought their wives, and our guest of honor was the venerable Fr. Christopher. Chris Callan and Michael Dillon also brought their children, while Matthew Callan was the heart and soul of the reunion, epitomising the next generation of Old Boys. He sure was the “last man standing” on the second night, accompanying the old fellas into the early hours as they nursed mugs of Cadbury’s hot chocolate. The weather forecast did not look too great earlier in the week but the sun started to beat down as the auld soldiers assembled to battle all the biere d’Abbaye the Belgians could throw at them. Indeed, temperatures reached the mid-30s during our day at Maredsous, all the more reason to disappear into the Abbey for a few swift halves upon arrival. The build-up to the reunion was almost as much fun as the event itself, as is often the case. The gathering was a year and a half in the making, with the belated dawn of the age of the computer on a bunch of fifty somethings ensuring everyone’s backsides got in gear for travel from the 3 corners of the globe (none of us have moved to Africa yet though Michael Nugent spends his summers in Zambia for a very good cause you will all be aware of). An almighty effort was made by everyone to get to Belgium (except for myself who lives a short car journey away! ), with our Captain Bryan Leggett and his wife Georgina winning the five euro prize for the most distance travelled, having come from Australia. The US contingency consisted of Prof McCarthy and his wife Susanne, as well as Michael Petesy Dillon in the company of other half Victoria and their two children Annemarie and Matthew. Unfortunately, the shy and retiring Dave Tierney had to cry off late in the day as his goalkeeping son had to undergo surgery. The other ex-pats were made up of the motely crew of Henry Hickey, coming from Scotland and Alex Blayney arriving from England. From the auld sod itself came Chris Callan with Denise and their four children, the aforementioned and very popular Matthew, Roseanne, Nicholas and Mollie. Dixie Duggan and Michaels Binchy and Nugent (I have just realised 40 years after we all met that a quarter of the class were baptised the same) flew solo while Jim Byrne, Eleanor, Michael O’Hara and Arnie Leahy attended with Eleanor, Tracey and Fiona respectively. My wife Pilar and I, as per mentioned, drove from Holland while – for unfortunate reasons – Ernie Holloway could not be present, though he was very much in everyone’s thoughts throughout the weekend. We were all very impressed at the last reunion in Adare in 2010 when Ernie and his wife made a real effort to be there, hence ensuring that the full complement of 1980 GOBS were assembled for the first time in 30 years. Unfortunately, a full house was not possible this time as, apart from Dave and Ernie, the other classmate who couldn’t make it was Francois (aka Frank) O’Sullivan who had been hoping to come but, in the end, could not be away from his family business in Dingle at such a busy time of the year. The first meal of the weekend – on the Friday night – was prefaced by some champers on the balcony overlooking the Meuse Valley. Michael Nugent, Fr. Christopher and Bryan Leggett gave the opening speeches and, as the night wore on, most of us came to the conclusion that we had mellowed a little with age – even Dixie! The bar closed a little earlier then anticipated (by our high standards at least) as the shananigans from our first reunion at Signor Sassi’s in Dublin began fading in the memory though Dixie made a gallant attempt to salvage a vestige of the group’s honour by squeezing in a last half case of wine to give the hotel staff a rare glimpse of some good old Irish craic! Our dotage getting the better of us, we all retired at the very civilized hour of half past one. On Saturday morning, we met in the lobby after breakfast to head up the road to Maredsous. We were met by Abbot Bernard Lorent, who kindly joined us for lunch in the visitor’s reception centre, a large and well oiled operation that keeps the Maredsous show on the road – maintaining the magnificent church, school and its funding of charitable work in Africa. Unlike Glenstal, the Abbey was purpose built and is a truly lavish and large scale example of the Catholic revival movement of the second half of the 19th century. Unfortunately the number of monks is dwindling although Maredsous is famous all over Belgium for its beer, bread and cheese. This is what draws half a million people to the place every year, with the visitor’s center becoming so large it is now housed in the refurbished old Arts school, away from the monastery. We all (suffice to say) sampled the beer and the cheese, the brew itself coming in three different types, containing 6, 8 and 10% per cent alcohol respectively – dangeous stuff early in the day (especially when the drink driving limit is close to zero!). After lunch, we presented Abbot Bernard with a celtic cross bought at the gift shop in Glenstal and, for the rest of the afternoon, we were in the very good hands of an excellent guide who, together with Père Claude (who had himself spent a year in Glenstal in the mid-70s – we remembered this out because Chris Callan told us he was a keen soccer player who showed us some new tricks) gave us spendid tours of the monastery and school. Even the younger members of the group were spellbound by the guide’s command of his subject and good grace with his audience. We were shown parts of the monastery which are usually out of bounds for the general public and most of us (Fr. Christopher being a notable exception) wished we had listened more in history class and paid attention at mass! The tour came to a satisfactory conclusion, with Jim, Dixie and Mick (O’Hara) even finding the beds they had slept in almost 40 years ago. Every school seems to have its New Wing problem! In 1979, the school gutted an adjacent church building, leaving the gable ends standing and filling the remaining edifice with a modern monstrosity which is out of keeping with the rest of the school / monastery. In addition to this, the general feeling was that the new purpose-built classroom block next to the school (in the woods) definitely looked poor compared with the fabulous new Academic Wing at Glenstal. A sobering thought that Glenstal, despite financial limitations, is not doing too badly at all. The one area Glenstal could learn from Maredsous on is making the most of day trippers to the grounds. Maredsous is clearly doing very well from the sale of its beer and cheese which means that, despite the falling numbers of faithful, it can easily cope with the economics of running an enormous and complex operation. On Saturday afternoon, in the crypt of the main church, Fr. Christopher held a short but touching service to celebrate our reunion. Thereafter, following a relaxing hour in the sun (or shade), gratefully supported by a dollop of the abbey’s beer ice cream (! ), we headed back to Namur. We were welcomed again onto the familiar confines of the balcony with a new round of drinks, followed by a fabulous meal. More excellent speeches were made by Bryan Leggett and Arnie Leahy and, mercifully, the bar stayed open considerably longer this time. The following day, an optional excursion to Brussels was organized where, after a great lunch in “Le Pain Quotidien” on the Place Sablon, some of the group parted while others continued sightseeing in the glorious sunshine. Some late night discussions had given rise to the possibility of the Camino de Santiago being the next reunion venue so it was fitting that, as we walked through Brussels – near to the entrance to the “Galerie de la Reine” – we came across a copper coquille de Saint Jacques in the footpath pointing us in the direction of Santiago de Compostela. An omen or a real possibility? Finally, after one for the road next to the Place de la Bourse with Fr. Christopher, the remaining GOBS went on their merry ways. It was a super weekend and I would like to take this opportunity to express my thanks to all the guys and their families for making this reunion such a great success.